Has An Extremely High Concentration Of Immunoglobulins! Colostrum, the nutrient dense, pre-milk fluid produced by all mammals during the first 24-48 hours after giving birth has an extremely high concentration of immunoglobulins (a uniquely structured, growth-essential protein that naturally contributes to healthy immune function). 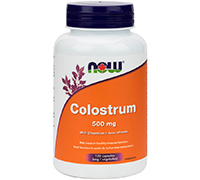 As a means of increasing overall immunity, expediting the body's natural process of wound healing and assisting in the maintenance of healthy bacterial response, NOW Colostrum is highly beneficial choice. No Synthetic Growth Hormones. Directions: As a dietary supplement, take 1 capsule 1 to 2 times daily as needed.